Geosite	Burren National Park	The Burren National Park is almost 1,500 hectares of uplands in the southeast of the Burren. 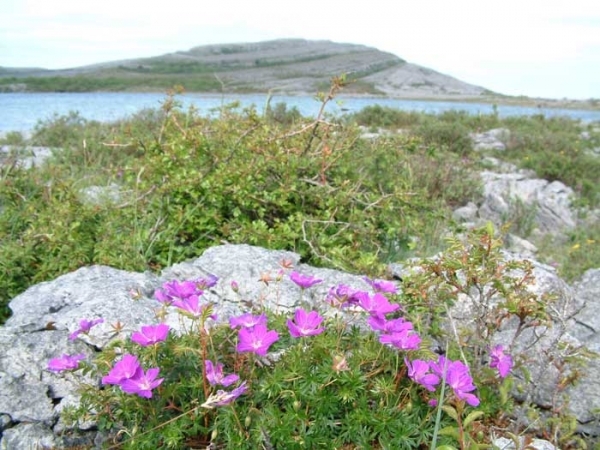 The area contains excellent examples of limestone pavement, calcareous grassland, hazel scrub, turloughs and fen. 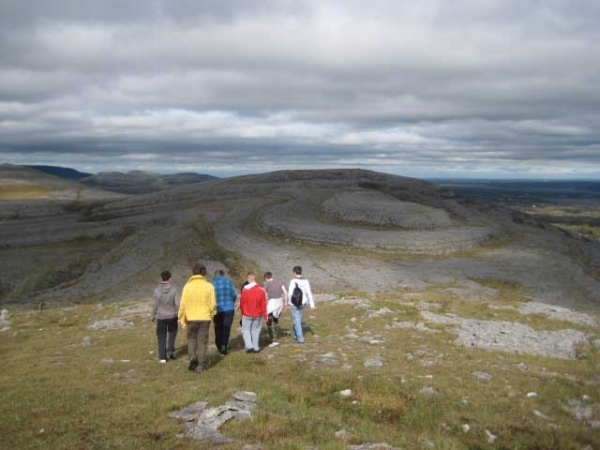 The Burren National Park is almost 1,500 hectares of uplands in the southeast of the Burren. It is owned and managed by the National Parks and Wildlife Service. 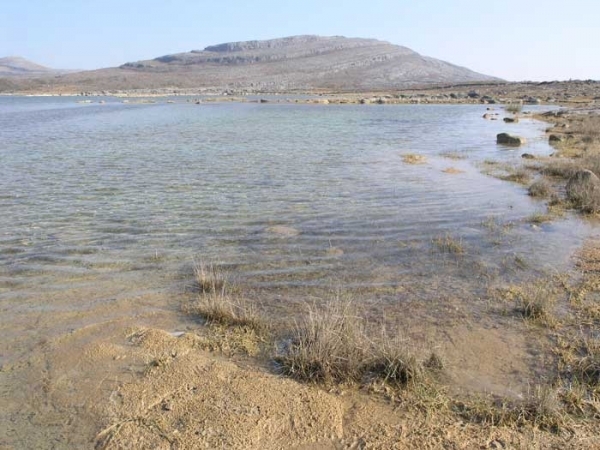 The area contains excellent examples of limestone pavement, calcareous grassland, hazel scrub, turloughs and fen. The wide variety of habitat makes this a biodiversity hotspot with birds, plants, lichens vertebrates and invertebrates all being well-represented. The sight of Mullaghmore, with its distinctive gently folded layers of limestone rising above the surrounding lowlands, make this one of the most memorable Geosites in the Burren. The limestone belongs to the 330 million year old Burren Formation and the rocks have been folded by the force of two major continents colliding almost 300 million years ago. This collision or series of collisions which took place over an enormous span of time were responsible for all the continents becoming joined into a single super-continent call Pangaea. Loch Gealain is the small lake between the road and Mullaghmore. The distinctive colour of the lake is due to calcareous mud on the bottom of the lake. The water in the lake is feed from springs which flow through the limestone, the water contains a lot of dissolved carbonate and this precipitates out to cover the lake floor. Because of the concentration of carbonate in the water it is unable to dissolve the limestone, in fact the calcareous mud coving protects the limestone. Notice the size and depth of grikes in the limestone near the road compared to the beside the lake where they are almost absent. The lake level varies considerably depending on rainfall mounts. As you walk up Mullaghmore you will see clusters of dark branching fossils. 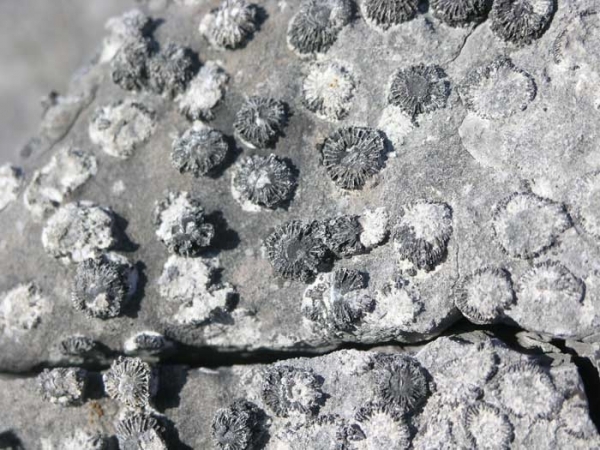 These are fossil colonial corals. They were originally composed of calcium carbonate like the rest of the limestone but have had their minerals partially replaced by silica (quartz). This makes them more resistant to weathering and parts of the fossils often stand proud of the limestone rock which has been dissolved by rainwater. The silica may have come from the minute skeletal parts of sponges called spicules. Under the pressure of burial and folding silica can become mobile and flow to other areas replacing fossils or forming irregular lenses of chert. There are two excellent examples of mushroom stones in a boggy area to your left as you ascend the hill. 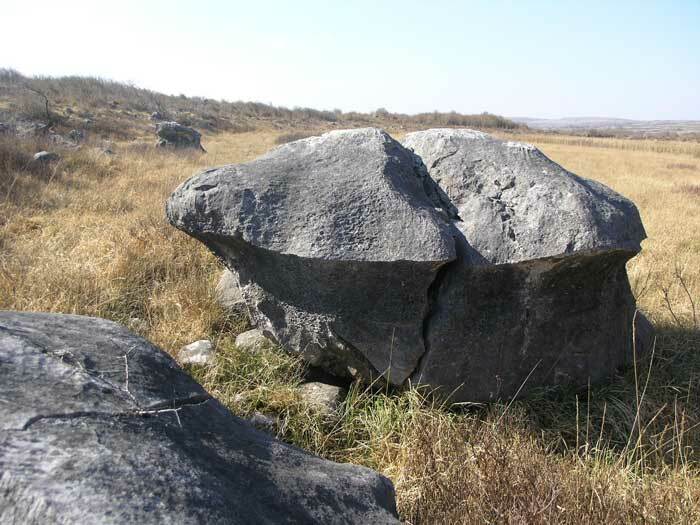 Mushroom stones are glacial erratics that have a distinctive concave lower profile with a horizontal upper edge. They are often found in wet or boggy areas and are thought to indicate the presence of previously higher water levels. The limestone erratic is dissolved by the freshwater lake or pond, the upper edge of the concave profile marking the previous water level.